Im a typical guy, and one thing that means is that I hate chores like laundry. Perhaps the only thing that makes it manageable is the cartoon philosophy of Zippy the Pinhead. 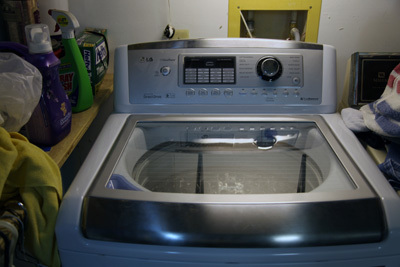 Life was good until our ancient Maytag washing machine finally gasped its last breath. Actually, it had developed an irritating leak. Not from the hoses, though; from the tub. Since Maytag is now an inferior brand, there was no point in trying to replace any parts like I did with the clothes dryer heating element. So I started my search for a high-tech replacement appliance that would save money in the long run. As I said, Maytag was out of the question; sadly, it is now a junk brand since it was bought by Whirlpool, who simply capitalized on the golden Maytag reputation while cutting product quality and customer service. The LG top-loading WT5001CW finally won out. Expensive? Yes; coming in at about $1000. But as an Energy Star appliance it will pay for itself. One selling point is that the direct drive motor carries a 10 year warranty. Another thing I like is that it doesnt have that central agitator post that is such an inconvenience with conventional machines when washing things like blankets, comforters, or dog beds. It just has a large stainless steel tub, which incidentally, means no rusting in the future. As a top loader, there is no problem following the progress of the load because the lid is fitted with a glass window. One reason the unit is high-efficiency is that it minimizes the amount of water used (the Home Depot sales associate estimated 90% less than conventional units). Because of that, the high-efficiency soap, fabric softener, and bleach all have their separate dispensers, and the machine empties them when required, depending on the settings and size of the load. There are a number of settings available. The cycles include bright whites, bulky bedding, heavy duty, permanent press, cotton, baby wear, wool, and more. Each of these offers choices of soil level, spin speed, and water temperature. All this information is taken into consideration when the machine is started. As soon as you make your desired settings and pull the trigger, the tub (which seems to be floating on air) begins moving around back and forth and moving clockwise and counter-clockwise while it completes the load-sensing and balancing phase. Another drawback is that part of the energy-efficiency equation is a longer processing time. The digital read-out estimates completion time, but dont expect it to be less than an hour, even for small loads. It is also a tall machine, and being a top-loader, short people are at a decided disadvantage. Yes, some people will require a step stool. The bottom line? I like the machine. LG has a good reputation across numerous product lines, which inspires confidence. Also, the high quality components should make for a long life. I just dont like replacing things. We have been using it for several months now and have had zero problems. And since it is an Energy Star appliance, I can be clean as well as green!